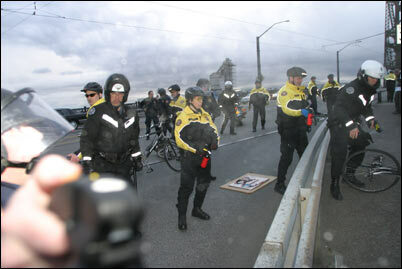 While covering the Portland anti-war protest (for the Willamette Week) on the Steel Bridge, I was at the front line, covering the clashes between the police and the protesters. I photographed them being pepper sprayed, then was pepper sprayed myself, directly in my face. The first feeling was like walking through a heavy mist as nearby pepper spray rose in the air. Then I was sprayed directly, and a wetness covered my eyes and the back of my neck as I turned away. The heat slowly rose, like standing over a pot of heating water, then became more intense as the oil-based pepper spray began to burn. The burning was localized around my eyes and neck, and became nearly unbearable as I struggled to keep my eyes open. Within 30 minutes (with the excellent help of Black Cross first aid-ers), I was able to see, and continued to photograph the event until about 9 'o clock. I saw the crossing of the Burnside bridge, shutting down of the Interstate, and lots of destruction perpetrated by a small number of people. When I got home, I began showering, at which time I realized that the pepper spray was still all over my head/face, and the warm water reactivated it, and it felt like I was being sprayed again, but it was even more painful. Charlene quickly searched the web for good remedies (this being the best site), and I tried in earnest to scrub the spray off my face. It took several hours of standing under the shower with the water as cold as it could go (while occasionally warming it up to keep my body temperature up) before the pain subsided. Charlene put the clothes in plastic bags and ran them through the washing machine twice (after taking them out of the dryer today, they appear to be free of pepper spray). I used baking soda and soap, and the baking soda seemed to help while it was on my skin, but the pain came back once it was washed off. Today, the area around my eyes ache from squinting, and I feel a very light stinging on the back of my neck.